It is not possible to date accurately the motte castle at Aberedw. It may possibly have been founded by the Baskervilles, operating under the Tosnys, around 1093 when the Normans launched a concerted invasion of South Wales. If this was so then it is likely that the castle was lost to Welsh forces in the period 1135-50 during the Anarchy of King Stephen's reign. This may also have marked the foundation of a Welsh castle here on a virgin site. There is simply no way of currently knowing with the scanty documentation left to us. Braose forces re-conquered the cantref of Elfael only in 1195 and it would seem unlikely that they or they followers founded a castle at Aberedw at this time. Braose control of the cantref was seriously threatened in 1196 and lost in 1208. By 1215 Gwallter Fychan the son of Prince Einion Clud (k.1177) was in control of the bulk of the land. Despite the taking of Painscastle by King Henry III in 1231 the bulk of Elfael and Aberedw remained under the control of native 'princes' until the death of Llywelyn ap Gruffydd, possibly near Aberedw, on 11 December 1282. With this Edmund Mortimer of Wigmore expelled the descendants of Einion Clud from the district. In the 1250's 60's and 70's these men had been alternately vassals of both Roger Mortimer of Wigmore and Prince Llywelyn. In their place at Aberedw on 24 June 1284, Edmund installed Walter Hackelutel, who in June 1264 had unsuccessfully defended Hay on Wye castle for Roger Mortimer against Earl Simon Montfort of Leicester. The motte stands at a high point where the ground falls steeply on the south side into the River Edw and on the western side to the former level of the River Wye Valley before the river was rejuvenated. The castle is therefore set in a strong position. The natural route of approach was from the east side, where Aberedw church stands. There does not appear to have ever been a bailey. The motte is surrounded by a ditch except on the south side where there is the precipitous fall to the Edw. A rocky outcrop to the east indicates that there was no bailey on this side, and this is the only side where one would have been possible. Recent sheep tracks have dug into the side of the mound and this has revealed its core appears to be made of many fragments of shaley local stone. This would tend to suggest that the motte is in fact the collapsed remnants of a stone tower of a type favoured by the Welsh at Dolbadarn in Gwynedd and Prysor in Meirionydd. Other similar towers on or within 'mottes' exist at Dolbenmaen and Aber in Gwynedd as well as Painscastle. By 24 November 1284, King Edward I gave his consent for Walter Hackelutel to continue with the fortification of the castle he had begun in Wales. This was undoubtedly Aberedw. On 6 October 1285 Walter Hackelutel was further pardoned a debt of £57 owed to Jews against "his costs and expenses in newly erecting a house in the Welsh Marches and afterwards crenellating it by the king's license for the better security of those parts". By 1293 the Tosnys of Painscastle had begun proceedings against Walter over Aberedw which they claimed as part of their conquest of Elfael which had occurred way back in 1093! Court cases passed possession of the land and castle between the two for a while and eventually the Beauchamps, successors to the Tosnys, seem to have won control of this little lordship and castle. Yet by 1398 the castle was not even deemed worthy of mention. It was a castle built in newly pacified land in 1284 - land that remained pacified until the rebellion of Owain Glyndwr. By 1300 it was probably already seen as obsolete and the fall of the castle to the Tosnys and their heirs probably sealed its fate, for why should they require a little fortress set in the mountainous wilds of Wales when they held the giant Painscastle nearby? The second castle built at Aberedw is situated on top of the steep slope made when the River Edw was rejuvenated after the Ice Age. It is a rectangular stone castle some 125 feet by 110 feet across. It apparently had four corner towers and was surrounded by a ditch and probably a counterscarp bank, though this now can only be seen on the west side. The south side was badly damaged by the construction of the now abandoned Cambrian Railway. Little now remains of Aberedw castle above ground although, as at most castle sites, probably some ten feet of masonry is still buried in its own ruins. Apart from the modern north to south running track that bisects the site, entrance is currently gained via a low causeway crossing the ditch to the site of the east curtain. There is no evidence that this causeway is medieval and quite likely, as at Clifford castle, it was constructed to allow easier access to the site. Medieval causeways at such castles are probably non-existent and what we see here is an easy post-Medieval route of access. Medieval access would undoubtedly have been gained via a bridge which may have stood anywhere along the enceinte. The mounds of rubble within the curtain wall at this 'entrance' probably mark the rubble of the curtain thrown back by ancient farmers to allow their animals easy access to the castle. Just south of the current 'entrance' is a protruding wall facing, nearly at right-angles to the run of the curtain wall. Possibly this was a window for a lean-to building or this may even mark the site of the now lost gateway. The castle was four square, apparently with a D-shaped tower at each corner. The south-east tower is now best preserved and seems to have walls about five feet thick. A minimal defensive thickness, and quite outdated by 1284! The north-west tower may have been slightly bigger than its companions and might consequently have been a keep. Much of the west side of the castle has been damaged by the later railway cutting and in several places the core of the old curtain and towers hang precariously over the precipice. The mortar still seen between the stones of the walls is now utterly decayed and without urgent attention it seems likely that more of this failed castle will soon disappear. 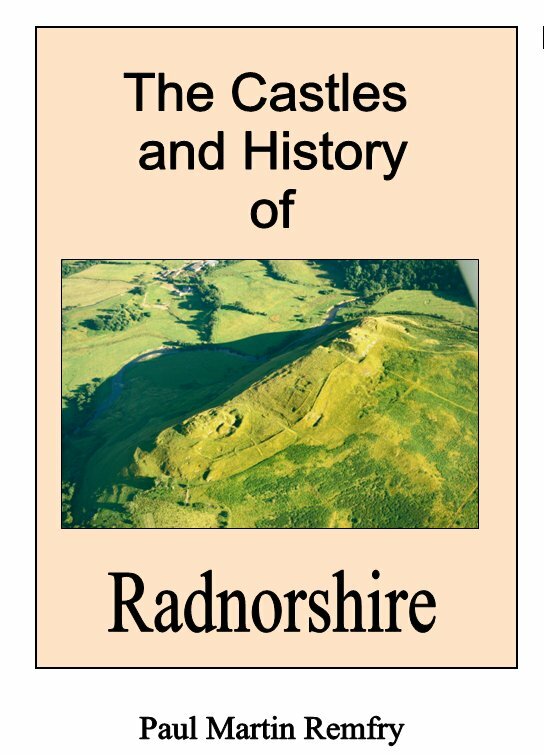 The Castles and History of Radnorshire (ISBN 1-899376-82-8) looks in great detail at both Aberedw castles and their history. This book consists of 309 pages of A4 and examines in greater detail the history and castles of Radnorshire and Rhwng Gwy a Hafren. Starting in the early eleventh century the book covers the age of the castles up to the Civil War of 1642-46. Each castle description is buttressed by numerous photographs and plans of the earthworks and remains where they survive. A new look is also taken at the battlefield of Pilleth and the evidence for the course of the battle is scrutinised. The book also contains genealogical family trees of the major historical Radnorshire families and a full index.